How ironic it is that seeing as my last piece was about my distrust of the outdoors, that I should find myself voluntarily heading outside on a slog through nature again. Though, I must say, there was a good reason for me scaling the infamous St. Catherine’s Hill. The thing is about Winchester is that it’s very pretty and the walk up to the aforementioned place is no exception. My friend and I took a longer way round, leading us away from people’s homes and under the canopy of trees. It’s a long road to get to the proper base of the hill, but there was shade so the hot day was bearable. And then you hit the stairs. You can, in theory, just walk straight up the hill. But that’s agony. So what you have instead is a few hundred wooden steps built into the hill, snaking their way up into the sky. The view is fantastic, no denying. But with my asthma and my friend not having their knee support it didn’t really feel like it was worth it. I think Led Zeppelin did a song about this. I wish I could say I appreciated the hard work we put in, but the Pokémon gyms at the top of the hill were ridiculously powerful so we gave up on the reason we’d climbed in the first place. Instead, we sat in the grass* and watched a seven year old boy explain his own Pokémon to his mother in great detail. His similar failure to beat the gym might have been funny if we hadn’t have been in the exact same situation. We hightailed it down as fast as we could, but we had already wandered a little further – so getting back to flat ground meant walking down the trodden path, not the stairs again. And rain + soil + open toed sandals = a bad time for Holly. My own fault, I know. But with every tiny step I made down the face of the hill I couldn’t help but worry at any point I could hit a rock and plummet to a fabulous death. That didn’t happen, obviously. But still. We got home and ordered pizza. I can’t say it was an exciting trip but, if you’re looking for a place to go on a picnic or just take in the views of Winchester, I can’t recommend it enough. If you’re looking to be a Pokémon master; try your luck elsewhere. 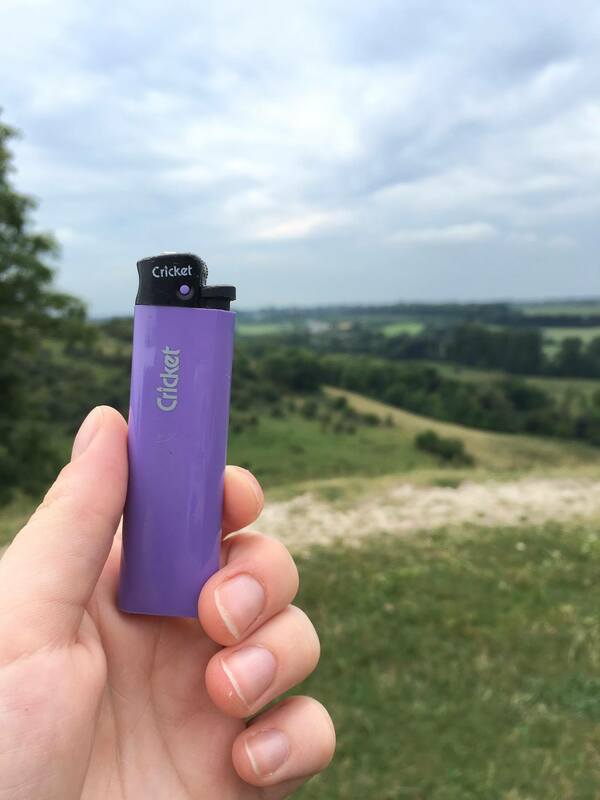 I was left with a picture of a purple lighter which was the same shade as hundreds of little flowers that bloomed on the hill. It was between that or blue, to reflect how I felt after my fruitless Pokémon hunting. *apart from when we saw a huge spider, at which point we sort of screamed and run away.